Bake the french fries as per the directions on the package.While the fries are baking, rub the skirt steak with the olive oil. Sprinkle the skirt steak on both sides with salt and black pepper. Transfer the steak to the grill and sear on one side for about 3 minutes depending on the thickness. Flip the steak over and repeat on the other side. Transfer the steak to a plate, cover with foil and let rest for a few minutes. Place the french fries on a large platter and sprinkle with Parmesan. 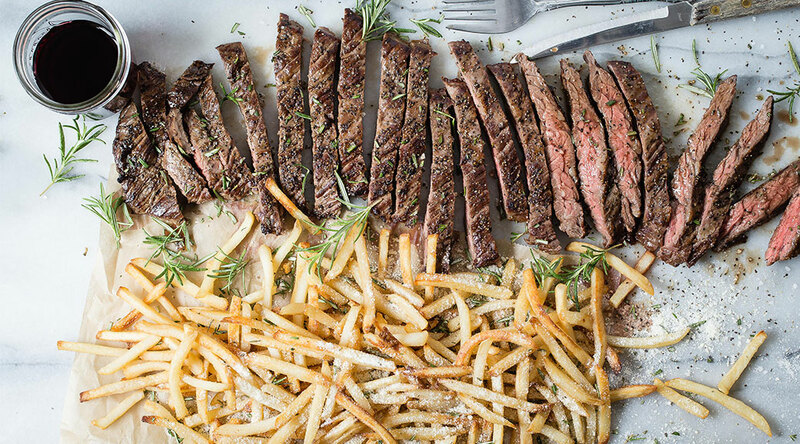 Drizzle the truffle oil over the fries and finish by garnishing with fresh rosemary. Serve at once with nice glass of Cabernet. Try pairing this recipe with Ravage Cabernet, one of the wines in our 2016 Summer Case of the Season.